good read so I wanted to share. 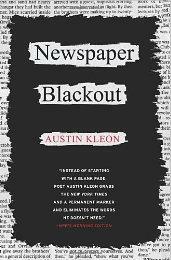 Posted by artist and writer Austin Kleon (to clarify, he is not the college friend…Kleon posted on his personal blog) of newspaper blackout poetry fame and the book (at left), he’s laid out a few tips on How to Steal Like an Artist. He has some pretty interesting, useful, thoughtful and insightful advice to share so I recommend checking it out. We’re supposed to get all kinds of rain this weekend and into next week here in NYC so I think I may remain mostly indoors. This is putting quite a damper on my shooting! This entry was posted in art and tagged art, Austin Kleon, Creativity. Bookmark the permalink.